As Kathleen pointed out last week's tip on how to get a publishing deal only made it to the lift of the publisher's office. So this week I'm going to make sure you end up right where you need to be: The publisher's window to his office. Research is vital. 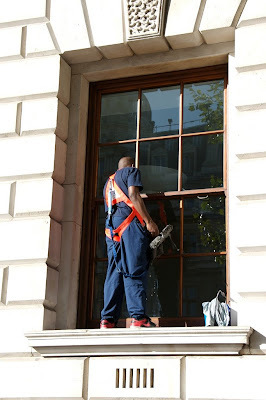 Not only do you need to find a publisher that is likely to be interested in your type of work, you also need to find out which window cleaning firm they use. Try google if you're not sure. Then - you still with me? Then get a job with that window cleaning firm and conceal your manuscript inside your overalls and climb to the right window ( don't look down.) As you clean the window you'll find that the water enables your script to stick to the window. Make sure you leave your name and contact details and that you have a get away plan should things turn nasty. Like I done told ya, Mr. Ranger, yer goin' about things like a daredevil. I know I said you could become the facialist or hair stylist of the editor in question - and, you said, that was women's work. Now I'd hate to quarrel with an upstandin' citizen such as yourself on such a matter - I think we'd end up tradin' some gunshots, and that ain't the kind of example you want to set for the good folks. Anyhow, I neglected to mention that there wasn't no shame in your becomin' a barber or a shoeshiner. Seems a whole heckofalot less dangerous than this fancy window cleaning notion of yours. Stella: I actually listened to you and sent Tonto off to be a hair stylist (although he protested much.) 2 days later he got a 3 book deal with a 3 figure advance. He's not taking my calls anymore. Anyone want to be my new sidekick? Stella? Mmm, that's a mighty interestin' proposition. How much kickin' does a sidekick do? I see your point, Stella. But the drama of the window washer shouldn't go overlooked. The Lone Ranger's style might not be right for everyone, but swooping into someone's 34th floor office, clinging to a thin cable, has panache. Were I a publisher, a move like that probably would prompt me to move the mss. out of the slush--before I called the police. You would take his side, wouldn't you?